"Maybe you don't believe it, Judge. But there's two kinds of justice: yours and other people's. Just don't forget that." The Man From Colorado doesn't arouse any strong feelings in its audience, but it does make for a fun ride. You'll forget it almost as soon as you're done watching it, because it blends in so well with countless other westerns. Name the usual plot devices of classic Hollywood oaters, they're all here: buildings burn, outlaws rob for gold, land disputes are fought, a posse hunts the villains, and we are even treated to a love triangle involving two best friends and the girl they both love. Glenn Ford plays Col. Owen Devereaux, a Union commander in the Colorado territory near the end of the Civil War. Devereaux is slowly going insane with bloodlust and power. He orders his men to attack a Confederate unit even though he can see their white flag of surrender through his binoculars. The Confederates are massacred, but Devereaux's image as a war hero is maintained when his best friend, Capt. Del Stuart (William Holden), buries the white flag before anybody sees it. The movie could take the time to develop this further, but it resolves it quickly in order to send its characters on their way. Devereaux, Del, and the troops return home as heroes after the war ends. Devereaux becomes the territory's judge and Del becomes the marshal. Everything starts out well, but when outlaws ravage the city's gold mine, Devereaux's need for power grows beyond the courtroom and into all aspects of the law. Inevitably, Del and his once best friend are at odds. There isn't as much tension as one would hope for when the two confront one another, mostly due to Ford's performance—at no point in time does he project emotion, and as a consequence his supposedly bloodthirsty judge plays more like a man in need of Prozac. Ford's lack of emotion is made up for by Holden's strong performance and the entertaining action sequences. Director Henry Levin doesn't offer anything new with these horse chases and robberies, but he supplies a healthy dose of familiarity with a streak of professionalism that only Hollywood adventures can provide. The movie really only loses its grip on the audience when it focuses on the subplot involving Devereaux's marriage to Caroline (Ellen Drew). There's promise in this story, since both Del and Devereaux suited her in the past, but none of it is realized. Instead, the scenes lag and tear the audience away from the main action. Thankfully, the love story does not get a great deal of screen time. Instead, Levin and company plunge us head first into the fights and robberies with enough energy to make the viewer forget that he has seen this movie a dozen times before, with a stronger male lead. The Man From Colorado is definitely not equal to the quintessential westerns of John Ford, but it passes as a nice helping of cotton candy in between those great westerns—that is, it'll tide you over, but it won't satisfy you on its own. 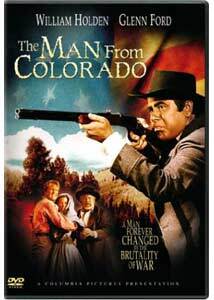 Image Transfer Review: The Man From Colorado is presented in its original 1.33:1 aspect ratio on a single layer. The image is flawed, with a great deal of print defects being present throughout. Contrast is not strong, but it's tough to tell whether that relates to the source material or the handling of the transfer. However, the Technicolor processing used in the making of this movie is well maintained in this transfer, with strong, vibrant colors (particularly reds) creating an attractive picture. There is an occasional dimming in the image, but it is rare and not terribly distracting. Audio Transfer Review: The sound mix is competent, but not noteworthy. The surround speakers are completely absent of sound and bass barely registers. Dialogue and sound effects are dispersed across the front sound stage, providing for a clear and well-balanced mix. The musical score also protrudes from the main speakers, accompanying the rest of the mix in a fitting fashion. There's nothing to get excited about, but it gets the job done. Extras Review: Only three trailers are provided as extras for this release. All three play together before the main menu, and there is also an option allowing for you to access the trailers from the menu. They're for the classic film noir Gilda; the special collector's edition of Silverado (the bloated 1980s western that nearly ruined the genre), and David Lean's 1957 masterpiece, The Bridge on the River Kwai, staring Alec Guinness and William Holden, which is presented in 2.35:1 nonanamorphic widescreen. All three trailers are offered in Dolby stereo 2.0, but none of them are particularly good. This isn't a particularly impressive DVD, and although the movie is enjoyable, it's not worth dishing out cash. The image is not perfect, but considering the age of the movie and its little known status, what more could you expect? The sound accurately presents the feel of 1940s Hollywood filmmaking, but it isn't anything to get excited about. Definitely wait to see this one before you add it to your collection.